Lucifer was a demon with vampirish tendencies. Living in the Devil's Castle in the Devil's Hand mountain range, he plotted to throw the world into eternal darkness and rule an Earth full of monsters. His exact age was unknown, but he hints that he is at least five thousand years old. He led an army of monsters and undead that were completely loyal to him, including Ghastel, a crimson demon who was a powerful warrior, and the hunchbacked Servant (also known as the Butler, or Igor). Despite being ancient, Lucifer had kept up with the times and was quite modern; his castle contained much computer equipment, a laser cannon, and a television (this last is black-and-white, though it may be a stylistic choice). He possessed the Sleeping Princess, a massive jewel that can channel tremendous energies when bathed in the light of the full moon. Lucifer had done this for thousands of years, every moon increasing the gem's power. Lucifer had two forms, though the change seemed more visual than anything else. He first appears as a very handsome man, almost a bishonen, with large red irises, dark blue skin, and a hair style rather similar to Goku's, though without the widow's peak. But when he wished to intimidate or fight, his irises shrank away to almost nothing, leaving him with pinpoint pupils. He grew long fangs and his face became noticeably less soft. 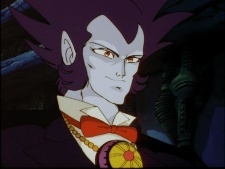 He dressed rather formally, complete with bowtie and a large necklace. During the daytime, he wore sunglasses. He was rather powerful, able to dodge or deflect a young Goku's blows effortlessly. He had a strong attack of his own, a scintillating scarlet sphere of energy that he could create and throw repeatedly. Lucifer's master plan was to wait until the Sleeping Princess has absorbed enough energy, expose it to one final full moon, and use the resulting power to fuel a giant laser cannon which will destroy the sun. Then, he will lead the planet's undead in the new world of eternal darkness. On the very eve of his plan's fulfillment, his castle was crashed by Goku, Krillin, Yamcha, Bulma, Pu'ar, and Oolong. Separating Bulma from the others, he was able to charm her into being the guest of honor at the night's ceremony. What Bulma doesn't realize until it's too late is that this consists of her blood being drained from her to be used as drinks when the monsters toast Lucifer's success. Before this can happen, the others arrive, as well as Launch, there to steal the Sleeping Princess. His army was able to subjugate them all and imprison them in a large wall of rock. He takes Bulma to prepare to drain her blood and reveals his plan to her. Goku looks at the full moon, becomes a Great Ape, and destroys the wall of rock. The others manage to remove his tail and together they assault the laser cannon chamber. However, they are no match for Lucifer's power, and during the battle he triggered the laser cannon to destroy the sun. Bulma screamed out to Goku what it was about to do, and he blasted the cannon with a Kamehameha. This did not destroy the cannon, but knocked it off its foundation and pointed straight at Lucifer. The cannon fired right as he looked down the barrel, and the massive energy wave killed him.